How will North Norfolk's businesses fare this summer? 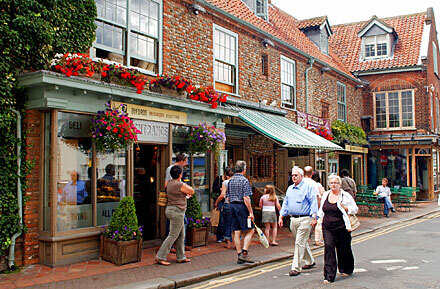 North Norfolk commerce – what will summer 2013 bring? How are the businesses in North Norfolk managing during the recession? For the North Norfolk retail businesses that are linked with tourism the start to the 2013 season was not a very lucrative one. The dismal Easter weather and the cold that still seems to continue is to some extent keeping the visitors away from the coastal resorts. Thankfully, when the sun shines at the weekends they do arrive, and the cafés, snack bars, pubs and restaurants at Cromer and Sheringham do particularly well. How much the visitors spend while they are in the area is of course another matter. With hefty winter fuel bills to settle and the ever-rising costs of virtually everything these days, most families are feeling the pinch. Wages are just not keeping up with price inflation and retailers are bound to feel the effect of reduced spending by holidaymakers this summer. The present economic situation accounts to some degree for the increased use of North Norfolk’s camping and touring caravan sites, as families look for ways to cut the cost of their weekend break or their main holiday. As the season progresses, such sites in the Cromer, Sheringham and Wells areas will almost certainly be very busy. Thankfully, the local economy is far from being all doom and gloom as property developers are still quite active. Hopkins Homes are building 50 new dwellings on the outskirts of Cromer and the big grocery chains are also investing heavily in North Norfolk. In addition, several of the local building firms are currently undertaking improvements on residential and small commercial premises in the coastal towns and villages. The new Waitrose store at North Walsham has now been trading for several months and the somewhat controversial Tesco store at Sheringham is steadily taking shape. Lidl are in the process of completing a new store on the Holt Road at Cromer, but on the negative side the nearby former Cromer Crab Factory buildings are still standing empty. Rumours are circulating about another new supermarket to be built at Holt but the name of the company involved seems to be a closely guarded secret. Of course many retailers now supplement their take at the till by making online sales. For some this can prove to be quite lucrative and it can support businesses through the quieter winter trading period. The locally based North Norfolk Web Design company has already helped several local traders to develop a meaningful internet presence.